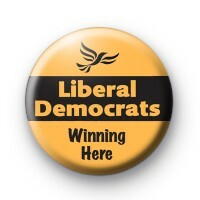 Liberal Democrats winning here badge. If you will be voting for Tim Farron's Pro EU liberal democrats in the 2017 general election, why not show your voting intention with this Liberal Democrats badge. The Lib Dems are likely to gain a lot of new pro europe voters in the coming election. We have badges for the major UK parties available in our Political badge section. Standard 25mm button badge.